"A labyrinth walk is a symbolic journey . . . but seen metaphorically the difference between the labyrinth path and the real world become blurred." I have been learning about labyrinths. Sacred geometry is a very amazing thing and the fact that the ancients understood the mathematics of the labyrinth at this level is more amazing still! My interest in labyrinths grew enough to decide to build my own simple labyrinth on our 35 acre property in Southern Colorado. I decided to make my labyrinth easy and loved the spiral designs. The classic design at the Chartres Cathedral in France was way too complicated. Built almost entirely by feminine energy, I solicited my female friends and family. I used the Chakra-Vyuha design for my labyrinth. This is an ancient design from India, and I loved its many spirals. However, building my labyrinth walk was more complicated that I had anticipated, regardless of the "easy" design I had chosen. The twists and turns within the spirals was to set me up for learning the many meanings of the metaphors of the path of life. Theda, Dawn and I digging up the roots for the Labyrinth. The girls and I with the circle for the Labyrinth completed. Now what was I to do with the circle already in place? I decided to keep it, and the labyrinth walk would have a choice of two beginnings. One would be a "false start." A diminishing path that runs along the outside edge where the circle remained, but eventually peters out as it rejoins the first spiral. When a walker enters my labyrinth, he or she would understand very quickly if they had chosen the dead end, and would have to turn around and choose the other beginning! A dead end - a nice metaphor for some of our choices in life. In my labyrinth walk, one can easily spot their mistake and turn around to start again. Would it only be so easy in real life. In my labyrinth, you can reflect and be open to your own personal dead ends! Jay and Sharon, walking the labyrinth. When one enters the labyrinth, one is unaware of the many twists and turns it will make on the path to the center. So true, too, is life. While we have no choice to enter life, we have a choice to enter the labyrinth. 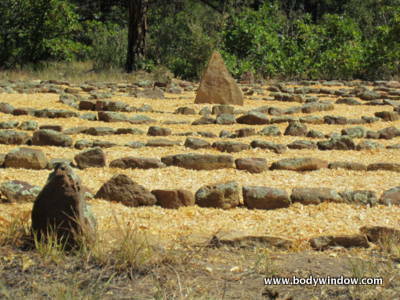 A labyrinth walk on a physical plane can be a powerful tool to aid you in connecting on a metaphysical plane. Walking meditatively through the twists and turns of the labyrinth can help you process your twists and turns in your labyrinth of life. Twists, turns, whirls and spirals are deeply-engraved archetypical patterns in all of us. All of nature and outer space utilize the patterns of sacred geometry, including the spirals of our own DNA. Sacred geometry is innate, within us. Sacred geometry connects us with all things. The sacred geometry of the labyrinth allows us to experience, without thinking, this connection. The connection with your inner self, with the Unitive Consciousness of all living things. This is where you find your center and where you find God. 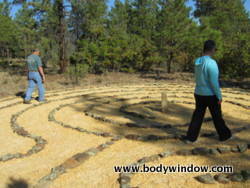 Walking a labyrinth is a powerful tool for personal insight and spiritual growth, if you chose to take the walk. Unlike a maze, a labyrinth walk starts and ends in the same place. The goal of the walk is to reach the center. Then one has to turn around and come back out the same way one entered. There are no dead ends or wrong ways - just a continuous path to the center and then back out. (Unless you are in my labyrinth "circle" as described above. I kept a dead end - so technically, mine is not a labyrinth). A maze can have multiple entrances and exits as well as multiple dead ends. A maze often is built high, so you cannot see over the walls. A maze, like a puzzle, is a left-brained activity, using deduction, while a labyrinth is right-brained, using meditation. In a labyrinth walk, you lose yourself in the process of the walk. You walk inward until your mind quiets, opening yourself for insights that may arise. With an empty mind and an open heart, the way often becomes more clear. The ground of my labyrinth is covered with wood shavings from the local lumber mill. The owner of the mill allowed me to haul off his shavings by the truckload, without charging me anything. The fresh pine scent was wonderful while we worked on setting up the base for the floor. As an added bonus, I discovered that the pine shavings made a very soft bed for walking the labyrinth with bare feet! 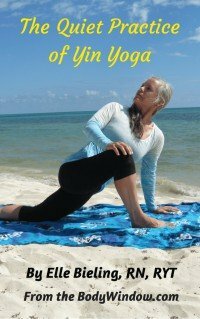 My bare feet kept me connected and more centered on the meditative task at hand. I could "earth" while I walked. The grounding that this provided was highly beneficial in my meditative labyrinth walk. Gwen and Nadine build the labyrinth base. My sister, Sharon, gathering lichen covered rocks for the labyrinth. The labyrinth walk seems to be a continuous spiral, then all of a sudden, the path turns back on itself. I meditate on the many changes in direction that have occurred in my life. Sometimes you have to retrace your steps and go backwards in order to learn the lesson. When I walk in opposite directions in the labyrinth, it gives me peace to accept the actual life's requirement to repeat a part of the journey for a lesson that still needs to be learned. We need to re-walk the same path until we learn the lesson that was there for us! After walking the labyrinth with its turns, back and forth and around, one arrives at the center. The center can be viewed metaphorically as "God" or as your own personal center. They really are the same thing, after all, aren't they? Or you can view the center as a place of peace. Whatever is in your heart that day. No right nor wrong, just being in the center. In fact, just being. Sharon in the center of the first built spirals of the labyrinth. It is good to pause in the center for as long as you like. Perhaps you decide to leave something here as a token of your journey, a gift, a thought, or even a burden. Whatever your heart needs to be reminded of, or to give or to get rid of. Here in the center of the labyrinth walk, meditate on what your life might look like if you gave more often of your gift, your token. What would it look like if you reminded yourself of this walk more often? What would your life look like if you were able to leave here what you left today, from now on? Search into your own heart for the meaning of your "center." After your reflections in the center of the labyrinth, you will walk back the way you came. Turning around, you realize that you must go back into the "real world." You journey the way you came in. On the way out, you may notice a lightness in your step or an easiness in your walk. Or you may notice a piece of the labyrinth walk itself that is out of place. You stop to put the piece back in its place. You may notice a twig, a leaf, something that could have tripped you, but didn't. 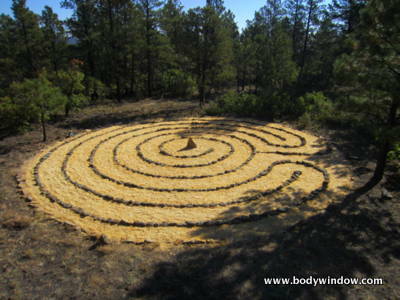 You may notice that you were able to remain calm and quiet during your labyrinth walk. You have accessed your inner Peace. You feel more spiritually aligned. You may have even thought of a solution to your problem. You feel more grounded and connected to Unitive Consciousness. You feel that your journey is supported by all who walked before you. You are freer and better able to go back to your real life. You are more accepting of all living beings. The Secret is in the "Walk"
The secret to the labyrinth is just taking the walk and staying in the moment with the process of the walk itself. It is really that simple. Consciously empty your mind and focus on the labyrinth walk itself. Using this tool, you will now have the skills to stay in the moment and be present in your labyrinth of life. 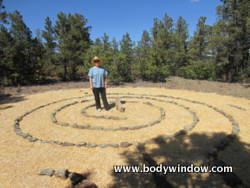 If you have no physical labyrinth to use as a tool for healing, you can do just as well with a finger labyrinth. All the same rules apply only now your finger does the walking. "Walking" a labyrinth with your finger is as calming as raking your own Zen garden in a sandbox. I do hope that I have inspired to take up the ancient practice of the labyrinth walk, whether you use your feet or your fingers. You will be better able to find your Inner Peace and the Divinity that is in you! May all your labyrinth walks be blessed with Peace and spiritual insight as you "walk" to re-connect with your body, mind and soul.